Danish citizens traveling to Vietnam as tourists and would like to stay in the country for less than 15 days, do not need a visa. You just have to show a return ticket which indicates that your stay does not exceed for 15 days, when you are crossing the border. If you want to combine your trip with other countries in the region and you need to travel to Vietnam again, you must apply for visa. Otherwise, it will take min. 90 days between two short trips to Vietnam. 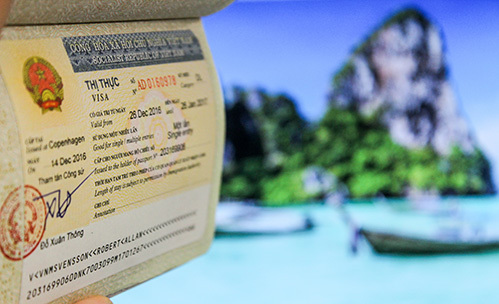 Therefore one cannot spontaneously travel from Vietnam to Laos and back to Vietnam again (after for example 8 days) without having applied for a visa to Vietnam prior to your trip. For business travel and tourism travel for over 15 days that requires a visa, we are delighted to that we can assist you. Passport must be valid for min. 6 months after return journey to your home country. Does it sounds troublesome for you? You are always welcome to visit us at our office and we will help you with your case. Passport must be valid for min. 6 months after your return journey to your home country. Colored passport photo. You ca have your passport phto taken at Alt Rejser (150 kr). Business Invitation Letter, which is made through the Vietnamese Immigration Authorities. Prices include all embassy fee and are applicable to Danish citizens only. All prices includes Danish tax (moms).